Product prices and availability are accurate as of 2019-04-22 21:03:31 UTC and are subject to change. Any price and availability information displayed on http://www.amazon.co.uk/ at the time of purchase will apply to the purchase of this product. 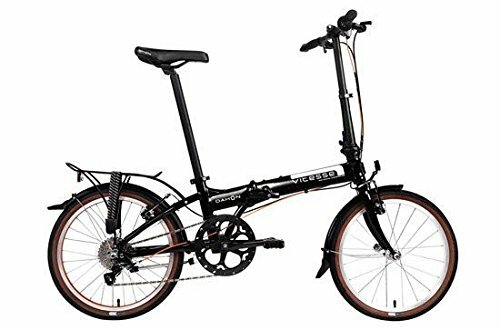 Recurring winner of folding bike shootouts that include bikes feing four times as much, the Vitesse is just one of Dahon's very most prominent bikes. This is light, trips properly, as well as costs below what nearly all expect. Its lightweight makes this excellent for excursions that include an extent through bus or learn. Perfect essential urban transportation. Speeds: 8. Frame Sizes: 1. Gear Inches: 33.2" ~ 88.4". Distance: Seatpost to handlebar: Min: 610 mm (23.8") Max: 635 mm (24.8"). Distance: Saddle to pedal: Min: 695 mm (27.1") Max: 955 mm (37"). Folding Size: 29 x 80 x 66 cm (11.3" x 31.2" x 25.7"). Folding Time: ~15 sec. Weight: 12.7 kg (26 lbs). Suggested rider height: 142 - 193 cm (4'8"- 6'4"). Max Rider Weight: 105 kg (230 lb). Frame: KA Series, 7005 butted aluminium alloy, custom-drawn Sonus tubing. Lattice forged hinge, patented Fusion and ViseGrip technologies. Fork: Integrated, patented Fusion technology. Handlepost: Radius V Telescope, adjustable, patented Fusion and V-Clamp technologies, forged aluminium. Handlebar: 6061-T6 aluminium, Flat bar. Headset: Dahon Fusion+, zero stack, cartridge bearings. Grip/Bars Tape: Ergonomic. Saddle: Comfort. Seatpost: 34mm x 580mm, micro adjust 6061 aluminium. Seat Clamp: Dahon Covert, forged aluminium, high leverage design. Front and Rear Brakes: 110mm V-brakes, aluminium. Brake Levers: 3 finger, aluminium lever. Brake Cables Livewire 5.0, anti-compression housing, slick cables, Dupont L3 lubricant, aluminium ferrules Front Hub: Dahon Mini, aluminium sealed. Rear Hub: Cassette, aluminium sealed. Spokes: 18/8 stainless steel. Rims: Aluminium, 20" x 1.5", aluminium singlewall, ground sidewalls. Anodized. Tyres: Dahon Kommuter, 20" x 1.75" with reflective stripe. Shifter(s): Neos 8 speed, indexed. Rear Derailleur: Dahon Neos 8 speed special edition. Crankset: Forged 6061 aluminium, double chain guard, 52T. Freewheel: 8 speed, 11-32T. Bottom Bracket: Sealed bearing, square taper w/ bolt. Chain: Indexed 8 speed. Pedals: folding Polycarbonate body and cage. Shift Cables Livewire 5.0, anti-compression housing, slick cables, Dupont L3 lubricant, aluminium ferrules. Cycle Condition: Brand New. Delivered in folded state. Inflation of tyres, fitting of pedals, stem, handlebars, front wheel, front brake cable, saddle and seatpost are necessary. Gears and brakes may require some adjustment prior to riding.